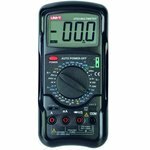 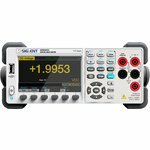 Multimeters: from the low-end digital and analog models, which are designed for radio amateurs, to the industrial high precision multi-purpose devices. 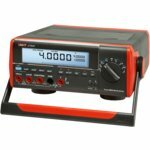 A digital multimeter for AC/DC current and voltage, resistance, capacitance, inductance measurements, and diode, continuity and transistor tests. 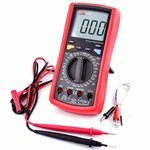 Digital multimeter for measuring AC/DC voltage, AC/DC current, resistance, capacitance, temperature, as well as diode, transistor and continuity tests. 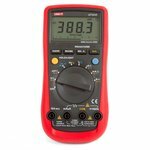 Digital multimeter for measuring AC/DC voltage, AC/DC current, resistance, capacitance, frequency, temperature, as well as diode, transistor and continuity tests. 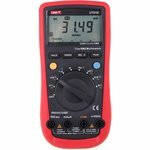 A digital multimeter for AC/DC current and voltage, resistance, capacitance, frequency, temperature measurements, and diode, continuity and transistor tests. 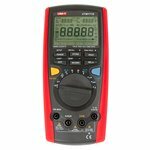 A digital multimeter for AC/DC current and voltage, resistance, capacitance, frequency, temperature, duty cycle, power measurements and diode and continuity tests. 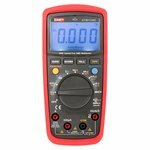 Bench type digital multimeter which measures AC/DC voltage, AC/DC current, resistance, frequency, capacitance, temperature and can be used for continuity and diode tests. 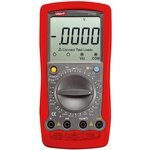 A digital multimeter for AC/DC current and voltage, resistance, capacitance, frequency, temperature (ºC/ºF), duty cycle measurements, for continuity and diode tests. 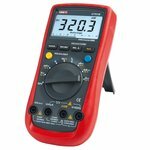 Digital multimeter for measuring AC/DC voltage, AC/DC current, resistance, capacitance, frequency, temperature, as well as diode and continuity tests. 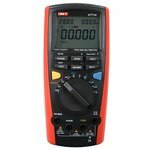 Digital multimeter for measuring AC/DC voltage, AC/DC current, resistance, capacitance, frequency, as well as diode and continuity tests. 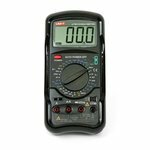 Digital multimeter for measuring AC/DC voltage, AC/DC current, resistance, capacitance, frequency, as well as diode and continuity tests. 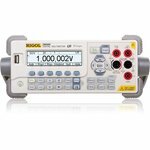 Data hold, peak hold, auto ranging, relative measurements. 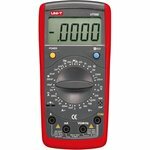 A digital multimeter for AC/DC current and voltage, resistance, capacitance, inductance, frequency, temperature measurements and diode, continuity, transistor and TTL logic tests. 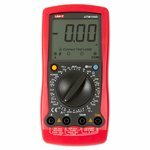 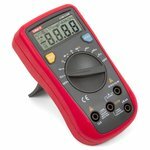 This digital multimeter measures AC/DC current and voltage, resistance, capacitance, inductance, frequency, temperature, tests diodes and continuity. 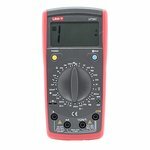 A digital multimeter for AC/DC current and voltage, resistance, capacitance, frequency measurements, and diode, continuity and transistor tests. 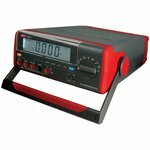 Desktop digital multimeter for measuring AC/DC voltage, AC/DC current, resistance, frequency, capacitance. 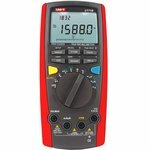 It also performs continuity and diode tests. 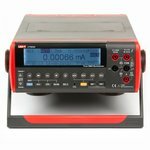 A digital bench multimeter for AC/DC current and voltage, resistance, capacitance, frequency, temperature , duty cycle measurementes and diode, continuity tests.